The seventh volume in Atkins' Quinn Colson crime series. Reluctantly back in the saddle as the sheriff of Tibbehah County, Mississippi, former Army ranger Colson goes up against a trio of bank robbers as cunning as they are clueless. Though the missing girls and dangerous bank robbers would be enough to fill the pages, Atkins throws in even more problems for Quinn to navigate around–creating the type of multi-layered, interweaving plot that Michael Connelly is known for with his Harry Bosch series. While Quinn isn’t exactly a Southern Bosch, Atkins has quickly made him the face of one of the strongest crime franchises in the game today. From start to finish, Atkins treats readers to a nonstop ride of suspense and action, with numerous colorful characters who drive the plot onward. 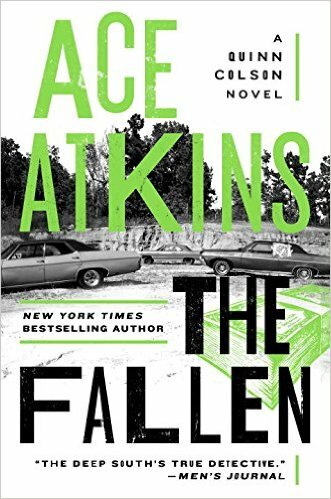 One of today’s most notable crime novelists, Ace Atkins packs a season’s worth of storylines into a single episode–making The Fallen his most complex and satisfying novel yet. Tibbehah has been an outlaw haven since bootlegging days, so it’s a professional insult when out-of-town robbers steal $192,000 from the First National Bank. But even that major crime is overshadowed when two local girls go missing and everyone fears the worst. What Atkins understands is that regional mysteries can go only so far when updating local crime patterns. It’s O.K. to rob the town bank, but you can’t burn it to the ground. Quinn has a rigorous work ethic, a bone-dry sense of humor, an Elvis-loving mama, a sister with a troubled past, a cool dog named Hondo, a checkered romantic history and a fondness for bourbon and cigars. (Really, why isn't there a movie yet?) ... Quinn stays so busy with all that he hardly has time to pursue Maggie Powers, a childhood friend who's just returned to Jericho and is striking sparks with the sheriff. But he'll discover just how many of those separate threads of plot tie together, and in what disturbing ways. And once again he'll realize how handy Lillie's sharpshooting skills can be. What did you think of The Fallen?